"She asked questions. Lots of questions! What were her calculations used for? Why were they important? How did her answers help design airplanes and flights? The men engineers noticed the woman who asked intelligent questions and how quickly she solved difficult math problems." Because of her outstanding ability in solving those problems Katherine was asked to join the space team whose mission was to get America's first astronaut into space. She felt she had been waiting for a long time to do such important work. Of course she agreed to join the team. She was, however, not invited to be present at group meetings. How could that be? Katherine knew it was not right. Since there was no law preventing it, Katherine made an appearance at the next meeting. There, she asked the questions she needed to be answered. She then used their answers to compute a path for the rocket. A launch was planned. Success with the first launch lead to her being a part of the plan for John Glenn's Earth orbit. He would not leave until Katherine had approved the calculations. What about the moon? Could a team travel around the moon? and then disappeared into ink-black space." Veronica Miller Jamison's use of mixed media brings Katherine's story to life for a young audience. 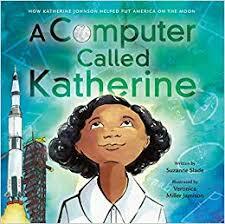 The historical context in the illustrations helps readers understand some of the barriers faced in Katherine's quest to find a place for herself in what had been a working world for men, many of them white. Changing perspectives and mathematical imagery are sure to capture attention and bring focus to her remarkable life.